5 Klavierstücke is Can co-founder Irmin Schmidt’s first album since 2015’s career-spanning Electro Violet, and finds the composer – ably assisted by Gareth Jones – playing not just one, but two pianos on five spontaneous compositions. Well, I say spontaneous; one of Schmidt’s pianos, a Pleyel, was prepared following the teachings of his onetime mentor John Cage, whose various prepared piano compositions over a roughly 25 year period are perhaps the best exemplars of adding nuts, bolts and all sorts of contraptions to piano wires to disrupt their typical sound. It is a painstaking approach that few have the energy and artistic vision to undertake, since one needs to almost surrender one’s compositional ideas to the piano before striking a single note; unprepared, a composer may, in their head, create an expectation of what a song might sound like – when prepared, the composer cannot make those assumptions, for the piano will never behave precisely the same each time unless the precise preparations are followed each and every time. It is one manifestation of Cage’s lifelong obsession with chance interventions into the composition process. Alongside the prepared piano, Schmidt also used a Steinway, his instrument not that much older than the octogenarian composer himself, and the five tracks alternate between both instruments, the Steinway or the prepared Pleyel. Aside from natural studio ambience, no further gimmicky or sonic trickery was employed, even though at times it’s hard to convince your ears that could possibly be the case. Delicate, filigree playing gives way to noisier, percussive sections from the prepared piano. At times, the repeated prepared bass note sounds like a very meditative jazz rhythm section that’s been asked to wait it out in the background, or notes that sound like the extended echoes of a gong. Rain-like sounds and insistent rumbling infiltrate the natural resonance of the sporadic unprepared piano notes. After a while, the piece opens out into a section that sounds like a clanking Hang pattern, one that is intensely melodic but unrecognisable from a piano. Percussive, low-register sketches are coupled with high-register sounds not unlike a cymbal. Loud shards of sound arrive without expectation, almost as if someone is driven to emphatically striking the side of the piano. Beginning with churning, bass-heavy arpeggios reminiscent of some of Throbbing Gristle or Dome’s most regimented work, the addition of sprinkles of unaltered piano ends up making this sound like some sort of heavily-shrouded exotica or a spontaneous jazz cop theme. ‘IV’ accelerates toward the end into a thunderous, panic-inducing conclusion that leaves nothing but cavernous reverb in its wake. This is vaguely reminiscent of Jacques Louissier’s interpretations of Satie’s Gymnopedies and Gnossiennes or a Sunday afternoon Bill Evans session, all gentle, delicate melody and harmonics. That’s the case until the very end, when a clangorous discordancy comes to the fore to bring this outstanding, understated album to a conclusion. The title of this 1976 Sunset Records / Universal Artists compilation of Can tracks works on at least three levels – first, it suggests an accessible introduction to the music of this influential but often ignored or difficult-to-pigeonhole Cologne unit, formed as it is from their mid-period legacy; secondly, it’s an amusing pun on the band’s name (mercifully, in spite of being quite good-humoured chaps, this was the only time they – or their labels – saw fit to make lighthearted fun of their name); finally, when combined with designer Paul Henry and photographer Trevor Rogers’s sleeve image of an open Campbells condensed soup can, there’s an inextricable link to Warhol’s semi-ironic brand of pop-art. So there you have it – best of, joke or artistic statement; take your pick. Opener was compiled by journalist and major Can fan Duncan Fallowell and Tim Read and features eleven classic cuts ranging from the impossible funk of ‘Moonshake’ to the screwy clank of ‘Spoon’. Fallowell offers gushing sleevenotes which I’ve provided below (he co-wrote ‘Dizzy Dizzy’, included here, and so represents a somewhat biased viewpoint) and the rear has that typically Seventies approach of turning the sleeve over to pictures of the band – ranging from Michael Karoli and Holger Czukay looking like extras from Easy Rider to Irmin Schmidt and Jaki Liebezeit looking like hippy professors; Damo Suzuki just looks suave – plus brief details of their respective roles. Among the facts quoted: Karoli was a pupil of Czukay and saw The Who play in Torquay; Schmidt studied under Karlheinz Stockhausen and Luciano Berio; Suzuki busked round Europe playing one chord on a guitar while improvising on top. 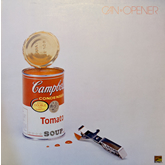 Czukay is described functionally as the bassist and engineer, while Liebezeit’s multi-cyclical drumming is heralded as the defining factor in Can’s music. You can imagine how oddly compelling that sleeve might have been to someone flicking idly through the racks of LPs in an HMV in 1976. So it was for me, albeit twenty years later, when I alighted upon this record in Time Records in Colchester. I bought this either just before or just after Sacrilege, and it served as my proper introduction to the music of Can. I’d been aware of them since I first read through the Mute Documentary Evidence brochure that inspired this site and my love of the label, but Opener offered the first real opportunity to get my head into their music; I fell in love with it instantly, and I used to play thus a lot, often late at night on a Sunday ahead of the following day’s lectures and classes. I hadn’t listened to this probably since I left university in 1998 until I played it yesterday whilst selecting LPs to listen to with my youngest daughter (six). She described Opener as ‘weird but good’ and grooved along to ‘Moonshake’ like it had been recorded today. Can was launched on an unsuspecting audience in autumn 1969, to a totally polarised critical reception. Their ability to arouse such strong confused feelings, for and against, was in itself a statement of their dynamism, confused because they were an enigma, could not be fitted to the current scheme of things, nothing was known of them as individuals. They are still the most unsettling of the German rock groups. Cologne is not Germany’s wildest city. This is why Can live there. Their studio, once a castle, now occupies an old cinema a few miles out of the city. Visitors are few – but never turned away, and in this easy practical atmosphere the band work. Can do not record numbers so much as discover songs or patterns in the process of recording. The timbre of their music, on record at least, has softened with their later albums from which this is compiled, and their music became more accessible. The key to Can’s music is not where it comes from or what the ingredients are, but how it works, how it moves and that’s to be discovered by listening.